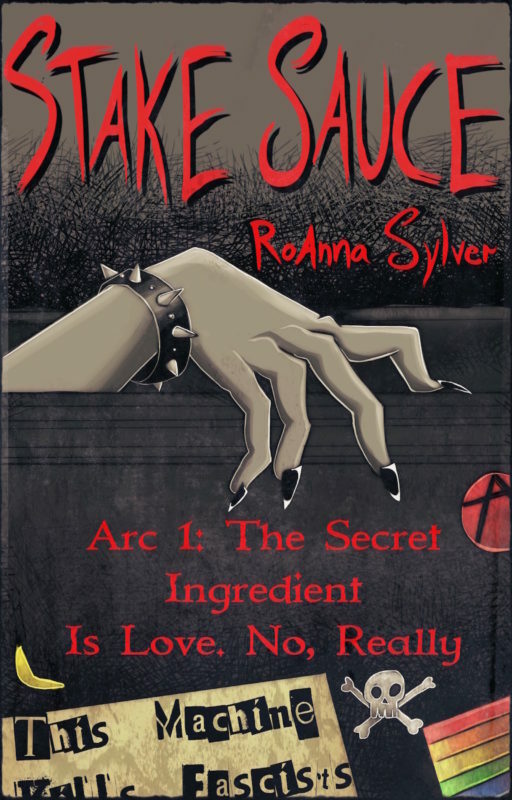 Home > Books > Stake Sauce, Arc 1: The Secret Ingredient is Love. No, Really. ACT 1, IN WHICH: A cute punk-rock vampire and a disabled firefighter-turned-mall-cop with a dark past join forces to battle the forces of evil. But he’s just about ready to give it up (living with PTSD and pain from the traumatic event that cost him a leg, a friend, and a lot more is hard enough), when something crashes into his life. And his window. It’s one of these creatures of the darkness—and he’s a lot less scary than expected. More cuddly, with dark fuzzy wings, and neon-bright hair.